Join us Monday, September 24th for the Mayoral Arts Debate 2018 , at TIFF Bell Lightbox, 10 am – 11 am. Be there for the first public debate of the 2018 election – admission is free, but register for your spot to avoid being turned away. Show Your Support! Artsvote Window Signs! Advocacy Resources – click through to all the “I Artsvote, we Artsvote” tools available plus printable sign for your window or door. On Monday, September 29, join ArtsVote at TIFF Bell Lightbox for the Mayoral Arts Debate and hear from Toronto’s leading mayoral candidates as they debate the role of arts and culture in our city. 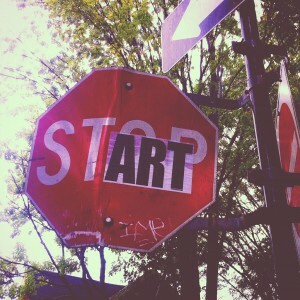 Should support for the arts in Toronto matter to candidates running for office on October 27, 2014? 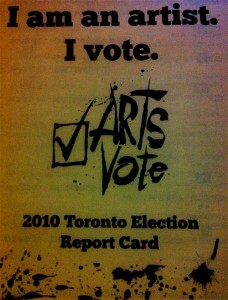 According to ArtsVote Toronto, the answer should be a resounding YES! Brad Lepp from the ArtsVote organizing committee is a Ward 18 resident. He sat down with councillor candidate Paul Alves aka Paul the Book Guy to chat art (and books!) in their neighbourhood. Download the podcast at http://paulthebookguy.libsyn.com/episode-107-arts-vote or at the Apple Store. You can follow Brad on Twitter at @BradLepp. Toronto Arts Foundation releases Toronto Arts Facts. What are Toronto’s largest cultural institutions looking for in a mayor? The leaders of Toronto’s largest cultural institutions have worked together to craft their vision for Toronto’s next mayor. You can read the Globe and Mail’s coverage here. What do you think of their manifesto? Is there anything that you’d add?